Lathes are power machines used to shape wood, metal or other material. The tool shapes the material when you quickly rotate it along its axis while pressing on a cutting tool. You must know the dimensions of your lathe in order to determine the maximum size and shape you can cut from your material. You can determine the size of your lathe by taking two measurements. 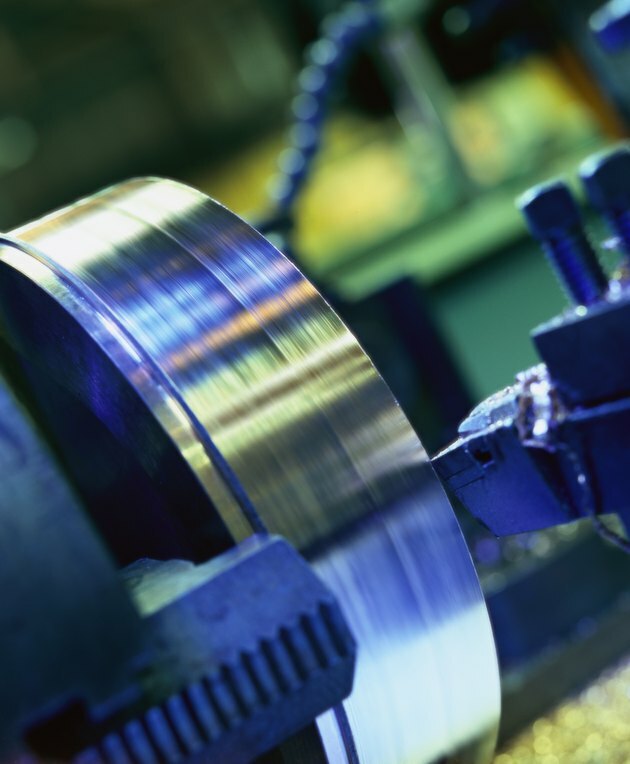 Lathes are used to shape metal, wood or other material. Locate the hole in the center of the chuck. The chuck is the circular metal object that spins to shape the material. It has a hole in the center of it. Visualize this as the hole in a doughnut. Measure the distance in inches from the center of the chuck to the nearest point on the bed. The bed is the flat surface your material rests on as you shape it. This is the first measurement. For example, the distance between the center of the chuck to the bed may be 4 inches. Multiple this figure by two to come up with the "swing." The swing is the largest diameter the material can be turned over, clear, on the bed. In this example, the swing is 8 inches. Measure the distance between both ends of the center of the chuck. Slide the tape measurement through the hole in the chuck and take a measurement of the chuck's length. This measurement represents the maximum amount of material the lathe can accommodate. For example, this may measure 24 inches. Combine the measurements. In this example, the lathe's measurements are 8-by-24 inches.